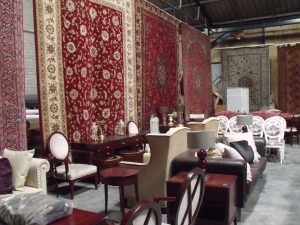 Furniture from the family owned five star luxury Red Carnation Hotels in Geneva, London, Guernsey and some items from Ashford Castle will be sold by auctioneer Aidan Foley in Cong, Co. Mayo on August 13. Live bidding is available through easy live auctions. 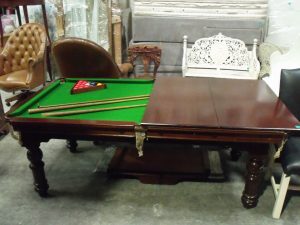 The no reserve sale of surplus items offers a wide variety of lots from a metamorphic billiards table to desks, chairs, couches, soft furnishings, Persian rugs, wall hangings and collectibles including an 1806 letter signed by Napoleon Bonaparte. Red Carnation Hotels acquired and extensively refurbished Ashford Castle, one of Ireland’s most luxurious hotels, after a receivership sale in 2013. Auctioneer Aidan Foley first conducted a sale of surplus items from the Ashford Castle refurbishment in 2014. The auction was 100% sold and was followed by two further highly successful sales of surplus items in 2016 and 2017. Among the notable lots that changed hands at previous sales were a bronze bust of John Wayne as The Quiet Man cast from the original statue in the village of Cong, the setting in 1951 for the film starring John Wayne and Maureen O’Hara. Cast by Mayo based sculptor Mark Rode it sold for 3,900. At last years sale the Black Yamaha piano played by Stevie Wonder at the wedding reception of Rory McIlroy sold for 7,800 over a top estimate of 3,000. Some of the lots on offer this time round previously changed hands at sales at Sotheby’s, Christie’s and Bonhams. 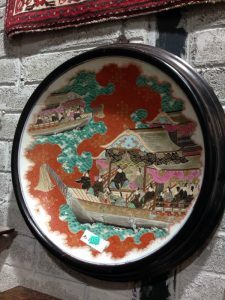 Among these is a collection of 19th century tapestry borders, the decorative edges that surround many tapestries are a collectible item in their own right. A sale like this appeals both to serious collectors with deep pockets and those in search of an unusual bargain lot with the provenance of a guaranteed luxury decorative setting. A selection from the sale. 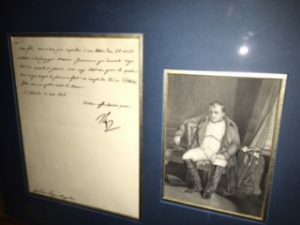 An 1806 letter by Napoleon Bonaparte, Persian carpets, a pair of marble pedestals, two mid 20th century designer sofas by Pierre Lottier, a collection of 19th century tapestry borders, art and garden furniture will feature at Aidan Foley’s auction in Cong, Co. Mayo on Monday, August 13. 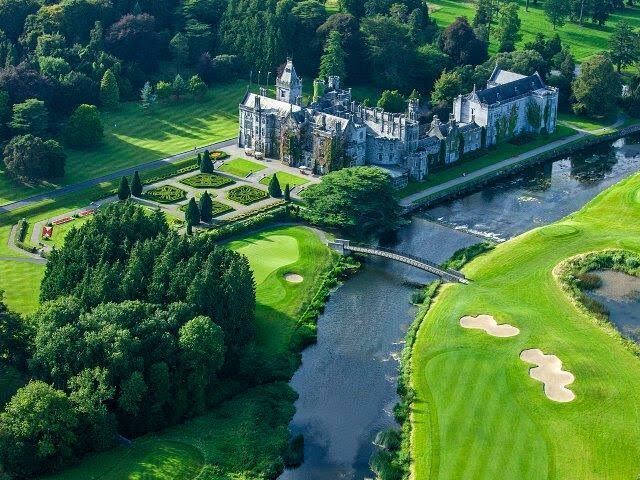 The Red Carnation Group, owners of Ashford Castle, has instructed Mr. Foley to sell furniture from their five star hotels in Geneva, London, Guernsey and Ashford. His previous sales of residual contents from Ashford Castle proved huge crowd pullers. Some of the lots on offer on August 13 previously changed hands at Christie’s, Sotheby’s and Bonhams. The catalogue will be available online on August 9. 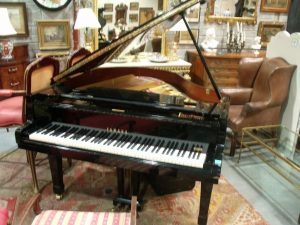 The baby grand piano played by Stevie Wonder at Rory McIlroy’s wedding is among the lots at Aidan Foley’s two day sale of contents from Ashford Castle in Cong, Co. Mayo on August 21 and 22. The black Yamaha is estimated at 2,000-3,000. 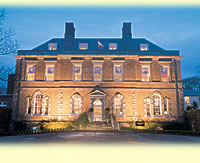 The sale of around 900 lots will feature residual contents from the hotel before it was refurbished by its new owners. 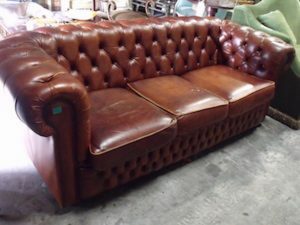 On offer is everything from sideboards to mirrors to wine racks, occasional tables and upholstered armchairs. Two previous auctions of contents from Ashford Castle by Aidan Foley were sold out in July 2014 and February 2015. The sale next week is of contents put aside for possible use in the refurbishment which were in fact never used. 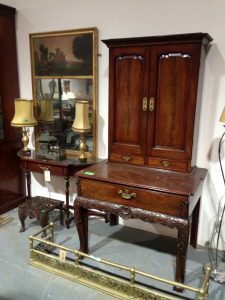 An Irish 18th century architects table with a panel bookcase top is estimated at 3,000-5,000, a 19th century serpentine walnut cabinet is estimated at 1,200-1,500. 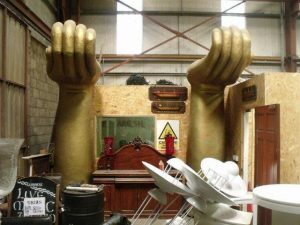 An auction of architectural salvage is always of interest to a wide variety of imaginative collectors. 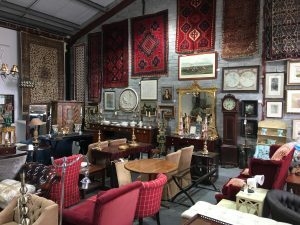 Aidan Foley’s two day sale of the stock of Bailey Gibson Interiors and Salvage at Oranmore, Co. Galway on June 10 and 11 is likely to be no exception. The 1,200 lots will be sold over two days. There are pitch pine beams and cast iron stanchions from Boland’s Mills in Dublin, vintage light fittings, garden furniture and urns and a selection which ranges from French doors to whiskey barrels. 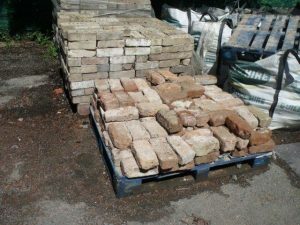 Garden enthusiasts and doer uppers will be interested in cut kerb stones and old building stones, outdoor lighting, a fountain, statuary, reclaimed brick and granite cobbles. Most lots will be sold without reserves. Around 1,000 lots from Cashel Palace Hotel are to be sold on the premises by Doneraile based auctioneer Aidan Foley over two days on April 26 and 27. This is to facilitate an extensive re-furbishment of the hotel which is about to get underway. There will be some art and antique lots, bedroom and kitchen contents as well as pub signage and the entire furnishings of the basement buttery restaurant. Aidan Foley has previously auctioned contents from Ashford Castle and Adare Manor. The catalogue is scheduled to go online from April 20.